The mass exodus from Detroit, Michigan since the 1950s has left the once thriving city with over 70,000 abandoned homes. The demolition of the vacant buildings is a necessary evil if the city is to have any chance of a rebirth, but the process is both costly and wasteful. Now, Mayor Mike Duggan plans to create a reclamation centre in the city, which will serve as a hub for the recycling of tons of valuable materials — including wood over a hundred years old — which can be salvaged from the houses before they are demolished. The hub will be housed in a 37,500 square foot vacant warehouse which the city will lease to an operator for USD 1 per year and create much needed jobs and industry in the area. There are already number of businesses and non-profits working on reclamation projects, such as Reclaim Detroit, which has been salvaging resalable wood and other materials from buildings soon to be knocked down. The materials are then resold and used by entrepreneurs — creating products such as guitars and furniture — as well as within redevelopments in the city. 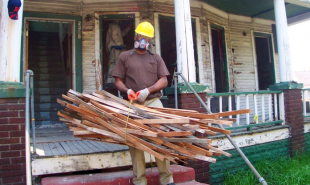 The deconstruction of houses raises the average cost of demolition by about 15 percent but it also creates revenue, celebrates Detroit’s rich heritage, lessens the millions of tons of debris which will otherwise end up in landfill and provides the opportunity for workers to develop useful, transferable skills. What other commercial opportunities could be created from Detroit’s blight?